Like a warm cup of cocoa or those falling-apart Uggs you just can’t toss, your usual winter routine—ski here, snowboard there—is familiar, comfortable and possibly a little bit boring. This season, shake up your schedule with a new destination or a whole new sport. We’ve chosen six of the greatest winter escapes around the state. There’s something here to fit every taste, every schedule and every budget. Find a friend, grab your keys and get ready to head out on a whole new adventure. What: Carving down the slopes by the light of the moon—plus pizza! Skip the crowds and pump up the excitement with an evening lift ticket at Brian Head Resort in Southern Utah. Ski, snowboard or tube until 9:00 p.m. Friday or Saturday evenings. Looking for a party atmosphere? Sport your cape and tights (for Superhero Weekend) or a string of beads (for Mardi Gras). These and other themed events give you the chance to dress up, get in the spirit and save some money while you’re at it. If you go: Night skiing is a bargain-hunter’s dream. An evening lift ticket is yours for just $15 (or $5 as an add-on to a day pass). Or, if you’re short on funds, check out the “Poor and Hungry” package: lift ticket, ski rental, pizza and a drink for just $25. Combine the thrill of rock climbing with the challenge of a sheer wall of ice. Utah Mountain Adventures hosts small, intensive classes that will get you vertical in no time (even if you have no prior climbing experience). Learn to “read” ice for safety, use climbing tools effectively and scale varying pitches in an eight-hour course. For more advanced climbers, the Multi-Pitch Clinic helps you build your skills and take your climbing to the next level. If you go: Come prepared with plenty of warm, layered clothing and essential climbing equipment. Utah Mountain Adventures provides helmets, harnesses and belay devices, but you’ll need to buy or rent your own crampons, axes and rigid-soled boots. Test your speed, strength and skill against some of the top athletes in the area, or try out a new sport under an experienced teacher’s watchful eye. From speed skating to luge racing, nearly every winter sport is represented at this series of events. Athletes of all ages and abilities are welcome: Friendly, fast-paced clinics are the perfect chance for your seven-year-old (or your grandma) to give curling a try. Or, unleash your winning spirit at one of the Winter Games’ official competitions. If you go: The Winter Games’ popular clinics fill up early. Register online in advance to guarantee a spot. (Registration closes 48 hours before each event—don’t miss the deadline.) Not feeling the competitive urge this year? Come watch the Games for free… and maybe find inspiration to participate next time. Looking for a break from ice and snow? You’ll find none of the white stuff at Southern Utah’s Snow Canyon State Park. Leave the down jacket at home and spend a long weekend hiking, mountain biking or just soaking up some winter rays. Explore a rugged landscape of cinder cones, lava tubes and giant sand dunes. Or, take advantage of the inspiring sandstone towers and sunny weather to enjoy an outdoor yoga session hosted by Red Mountain Resort. Snow Canyon’s mild winter temperatures—highs average in the 50s—make it a user-friendly destination all season long. If you go: Reserve a tent or RV site at ReserveAmerica.com. Nearby St. George is a great day-trip destination. Grab a hearty, casual breakfast at Bear Paw Cafe, or make it a memorable evening out with the Southwest-influenced fine dining at Painted Pony. 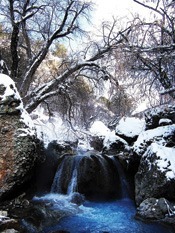 Take the chill off with a dip in Utah’s best-loved natural hot springs. A 2.5-mile hike brings you to this series of clear, rocky pools. (You’ll know you’re almost there when you catch a whiff of sulfur.) For a milder experience, pick a pool farther away from the foot of the falls; for a thermal blast, dive right in at the base. Access is available year-round, but soon after a snowfall, you’ll get there quicker by strapping on snowshoes. If you go: Don’t forget your swimsuit. Skinny dipping may be the norm at some hot springs, but it’s strictly against Utah County law. Chalk up some eco-karma points by bringing along a plastic bag and toting your own (and maybe someone else’s) garbage out. Enjoy the hush of a moonlit night, where the only sound is your skis or snowshoes sliding over the powder—until the sudden cry of an owl splits the darkness. Led by a naturalist, you’ll see a peaceful side of Sundance that most people never experience. Bring the whole family along for this pure, back-to-nature event. Or, for an ultra-romantic night out, take your sweetheart on a solo expedition along a network of backcountry snowshoe and cross-country trails lit by the full moon. Dates and availability are determined by weather and moon phases; see Sundance’s website for a calendar of events. If you go: Owling excursions cost $30 per person and include snowshoes, guiding and trail use. Unguided jaunts cost $15 per person and include equipment rental, but bring your own flashlight (or, better yet, a headlamp) along. Trips depart from the Nordic Center, two miles from Sundance Resort.